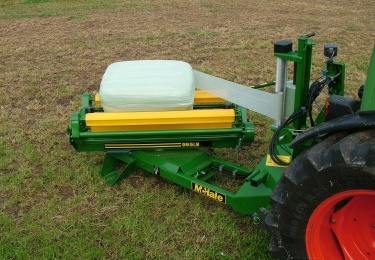 The McHale 995LM mini square bale wrapper is the practical and versatile solution for wrapping conventional square bales and mini round bales. McHales common sense design, quality components and precision engineering, mean the 995LM mini square bale wrapper is the trusted choice for farmers who want high output and consistent performance for use in static locations. On the 995LM mini square bale wrapper the rotating rollers ensure an even rotation of the bale and the efficient application of the film. Versatile too, with a simple adjustment the 995LM mini square bale wrapper will equally and efficiently wrap mini round bales. Like all McHale square bale wrappers, the high output 995 LM mini square bale wrapper will give you a tightly wrapped bale that contains all the natural juices for increased nutritional value, while improving environmental protection.